Flaxseed oil is nature's richest source of vegetable-based vital Omega-3 fatty acids. Barlean's 100% Organic Flax Oil is known as the "world's freshest" because, just like the entire fine family of Barlean's products, it is truly cold-pressed, pure, unfiltered and unrefined – just as nature intended. Our proprietary cold pressing results in clean, delicious oil that doesn't need to be filtered to achieve its fresh flavor. 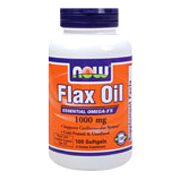 The result is the freshest, best-tasting flax oil available. Of all known food sources organic flaxseed oil has been recognized as nature’s most abundant source of vegetable-based vital Omega-3 fatty acids. Recent scientific research, coupled with flaxseed oil’s long history of therapeutic use, has propelled essential fat supplementation into the forefront of human nutrition. As a dietary supplement, take 3 softgels 2 to 3 times daily, preferably with meals. Consider taking this product in combination with NOW® CoQ10 and Tru-E BioComplex™. Organic Flax Oil 1000mg is shipped in a discrete, unmarked package. Orders are processed immediately and usually take about 3 to 5 working days to be received. We do ask that you try it for 2 to 3 weeks to feel the full effects. Any information received is used only for order processing and shipping purposes. Your information, such as e-mail address, will never be disclosed to a third party.